Once again it was an evening of friends and fabulous stamping art! 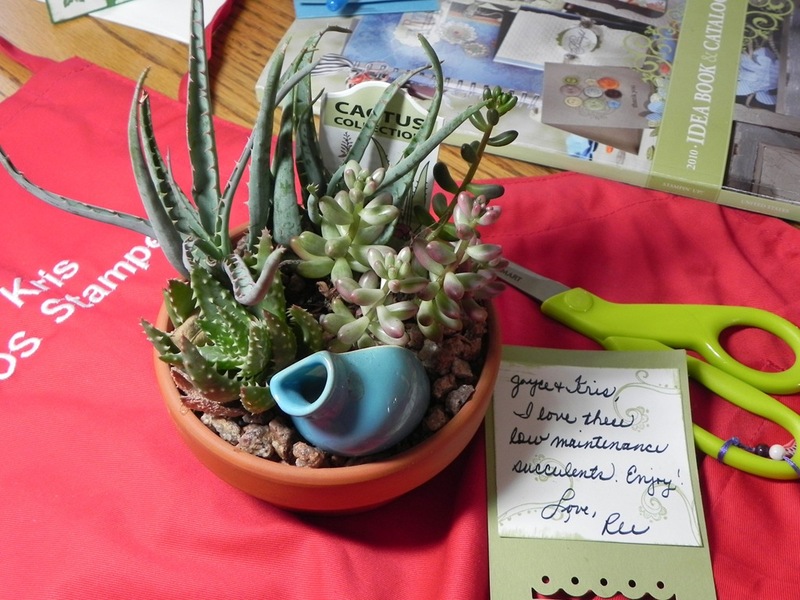 Our sweet Miss Ree gave us a succulents garden for our screened room once we get it livable again. Have to share the three wonderful projects we Spaced Out Stampers created at Ree’s oasis for stamp night. New technique for me is the tissue paper. See the card in the upper left. 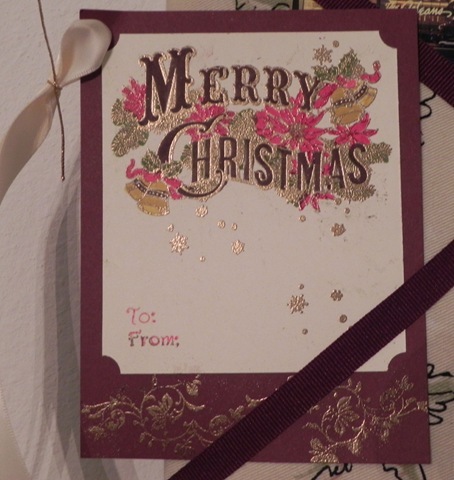 We stamped on a piece of whisper white card stock using markers on the rubber. Then spread that surface with glue stick. The tissue paper, cut to same size, is crumpled, smoothed back out, and applied to the glued surface. I can’t wait to use this again, I just love how it looks – so soft and dreamy. The gift bag in the upper right is a clever little item for tucking what ever goodie you wish to give. It starts out as a simple white paper bag. Although it looks plain white in this photo it is actually rolled with turquoise using the vintage vogue wheel. The bag is pressed with the dotted swiss folder and the rest of the elements are added. The ribbon is attached through holes made with her Crop-a-dial. I had so much fun playing with all my circles for the bottom card. It is a visual treat once you are done. Thanks to Ree for another super evening! 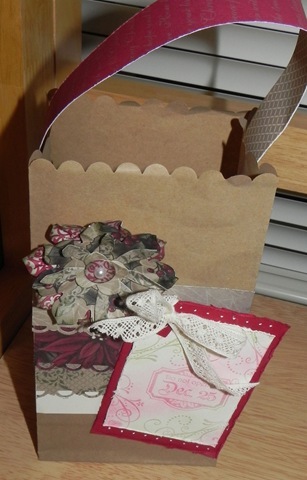 A card, gift tag and a darling gift bag. Too cute! Ree is the best Stampin’ Queen! She always has us make the most beautiful items. Claudia was the hostess so she supplied us with yummy snacks. I understand her raspberry pie was excellent. Or should say it was definitely a “rich razzleberry” desert. When I walked outside after work today at 6:30 pm I was so pleased to feel the cool air for a change. I will enjoy the temperatures in the 50’s and 60’s for a while. And, I am looking forward to working on my Journey into Christmas album. Today is day one and I have a photo and a topic for the first day. Some great sites offer a class where a prompt a day can be emailed. After reading some of the prompts I realized I was better off not going that route. 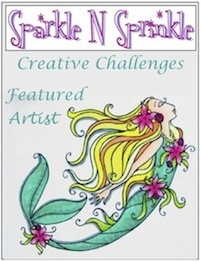 Coming up with my own idea for the day may become quite a chore, but having prompts I can’t work with don’t work either – gotta go with one or the other and I’m glad to be going with doing it on my own. Not that I won’t look for whatever inspiration I can find on the Internet, of course. My first day theme is decorations. I don’t have the page put together, but at least I know what it is to be. Knowing the theme is the hardest, putting it to paper is the fun part. Still trying to decide how to do the unified numbers. I saw a tutorial (and was sure I could go back to it) somewhere on making matching embellishments for numbers so they carry the same feeling across all the pages. She used the same elements on each, just the number differed and she blinged up the 25th to make it more special. She had a ribbon base and then punched elements layered basically the same. My sleeplessness paid off last night. I just wasn’t ready to go to bed. One of the perks of retirement is that I didn’t have to for the purpose of getting up early. 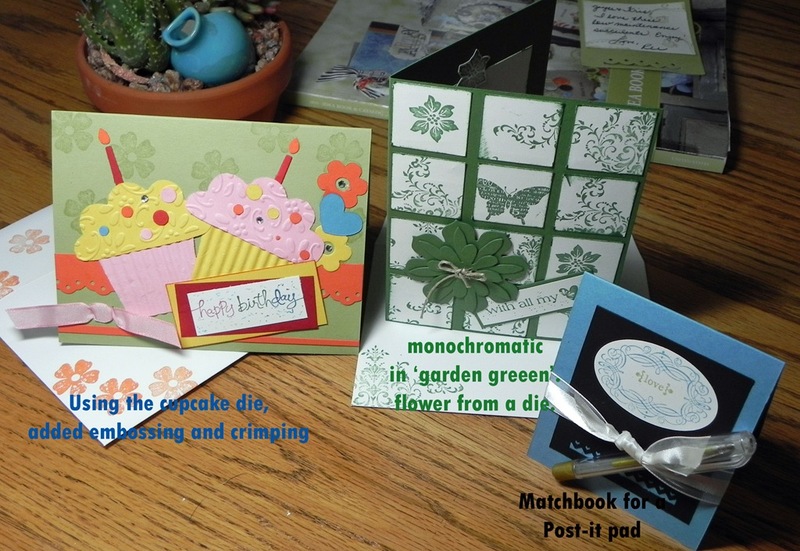 I wanted to go make a card so off the my stamp room I went with the beginnings of an idea. 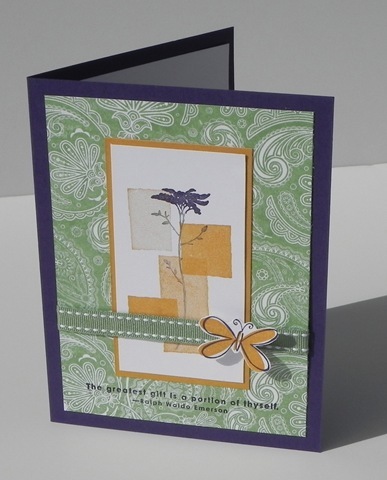 I knew I wanted to used the toned shapes stamp from the “Sweet Shapes” set and put a flower on top. And I knew I wanted to used one of my Impression-Obsession background stamps. with that in mind I gathered the stamps and stood in front of the ink rack and these three colors jumped out at me – wild wasabi, elegant eggplant, and more mustard. 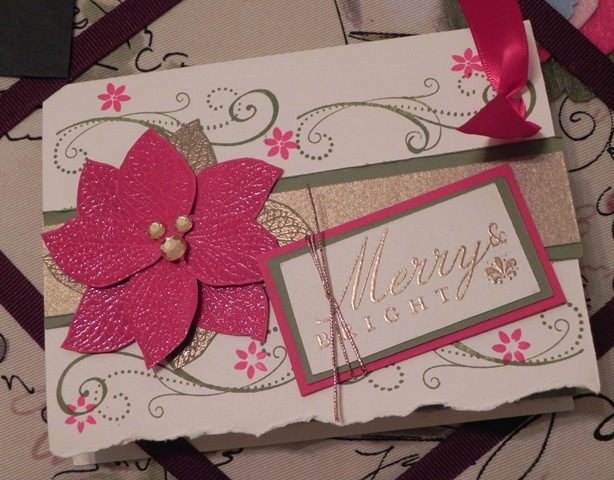 I love the way this card turned out. What do you think? The inside panel has a flower stamped in the bottom right too. The two-step butterfly is popped up over the wild wasabi double stitched ribbon. I am going to my Stampin’ Up stamp club tonight and I am looking forward to the time with the “Spaced Out Stampers” this month. My big issue is that I have run completely out of more mustard card stock – not acceptable. At one point I would have thought a pack was in hiding somewhere, but since I have recently organized my papers that just isn’t the case. I had been working from scraps and now that supply is diminished to nothing. 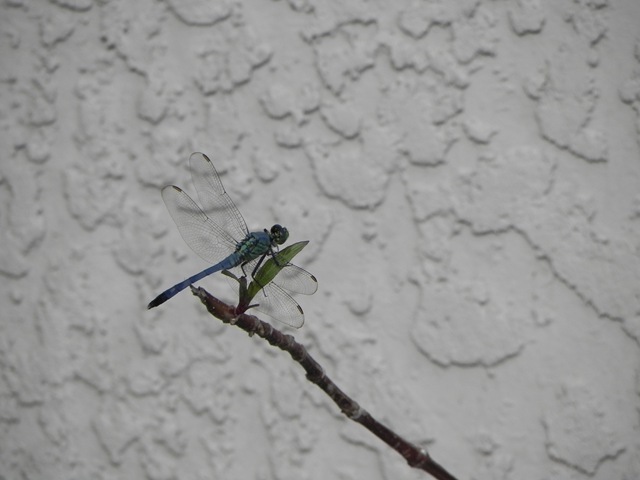 While I was in the beautiful sunshiney morning to photograph my card I was fortunate to capture one of the dragonflies that capture our hearts. These delights are so hard to photograph because of their delicate, transparent wings – I need them on the right background or you can’t make out the wings. When I spotted this one on a branch next to the house I turned my camera and ran the telephoto out. It may not be the most focused shot but without a tripod I think it’s pretty good.